Salvatore Ferragamo is another prominent name in the parade of Italian fashion designers. He was born in Bonito in the family of 14 children. His early passion for design and fashion was noticed when Ferragamo made his first pair of shoes. But he found his fame and fortune when he went to the United States and started making shoes for the Hollywood stars and other elite customers. Later he returned to Italy (1927) and concentrated on his own fashion brand. Right now this italian fashion house sells many fashion products, from luxury shoes to perfumes, accessories, such as men's and women handbags, watches and clothing for both sexes. Ferragamo men's bag collection offers various handbag types. The bestseller among this designer' men's bags is the messenger models and black shoulder bags. Most unusual are the briefcases in wool and leather trim. There are also simple black leather tote bags and brown leather messenger bags that look very masculine and attractive. 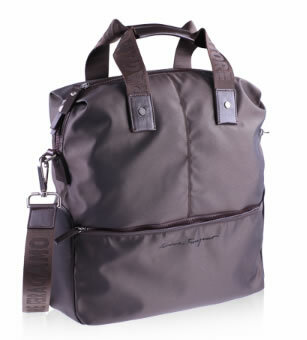 If you are not fan of the brown leather handbags, Ferragamo has a great variety of shoulder bags for men in black color. All of them are laconic in shapes, they are made of top quality materials and they are functional as well. If you need a durable briefcase in great leather, Ferragamo briefcases offer one of the most elegant and practical leather briefcases on the designer briefcases market. The leather is an embossed buffalo leather and the interior has been carefully designed to give the maximum comfort. 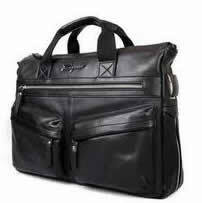 Also the there is a selection of small leather handbags and shoulder bags for male clients. If the leather case price is too high for you, try the nylon material messengers. For example, this computer bag is quite spacious, looks decent and has multifunctional pockets. It can be also carried in arm with two handles or carried on shoulder (the strap is adjustable). The price for this model is EUR 470 (655 USD). The dimensions are length - 36 cm, height - 36 cm and width - 12 cm. In inches it is 12" x 12" x 4.7". This laptop bag is sold online with world shipping options offered. The color choice for the particular bag is deep brown and black. Ferragamo sale can bring the opportunity to purchase some of these handbags at a lower price. Not all collection is discounted, of course, however there are great deals to buy discounted briefcases and gym bags from this designer.